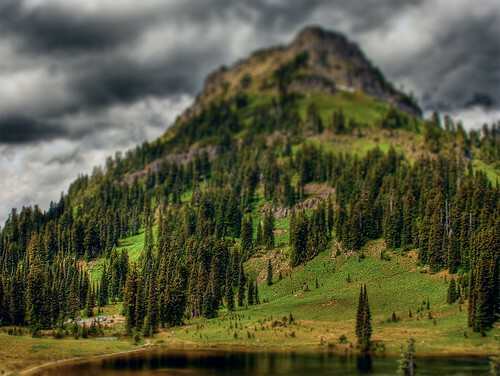 Yakima Peak Fake Miniature - HDR and Tilt Shift, uploaded into Flickr by Kell Bailey. Click on pic to see it in Flickr. This is an HDR processed image, and a good one at that, but it's also a tilt-shift processed one too. That's what gives this shot its miniature look. I kinda wanna know where the model train is, but this is a real place...but you might not believe that if you SEE IT IN LARGE ON BLACK. Need proof? Here's the mountain, and just about any other you want to search for, on peakware.com.